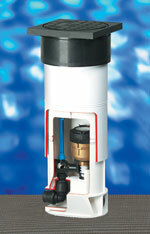 By installing the meter below ground level it is protected from frost and impact but becomes exposed to ground water. This is an important consideration as dials can become obscured by standing water or deposited silt, and electronics may be damaged. In order to exclude ground water, sealed boundary boxes are used for most encoded meter installations. We offer both sealed and unsealed designs. Where the ultimate in protection and ease of installation is required we offer the innovative Talbot Matrix box from Tyco Waterworks which provides a robust protected environment in which to install residential meters. Constructed entirely from composite polymers, the Matrix box is tough, corrosion resistant and has low theft-value. Its ingenious design makes it easy to handle and install as well as being durable. For installations where a traditional cast iron lid or unsealed construction is preferred, or if inline bodied meters are in use, we also offer the Irish-built WSC boundary box. Where several metered supplies are to be split off one incoming main we offer manifold systems in several different outlet combinations.